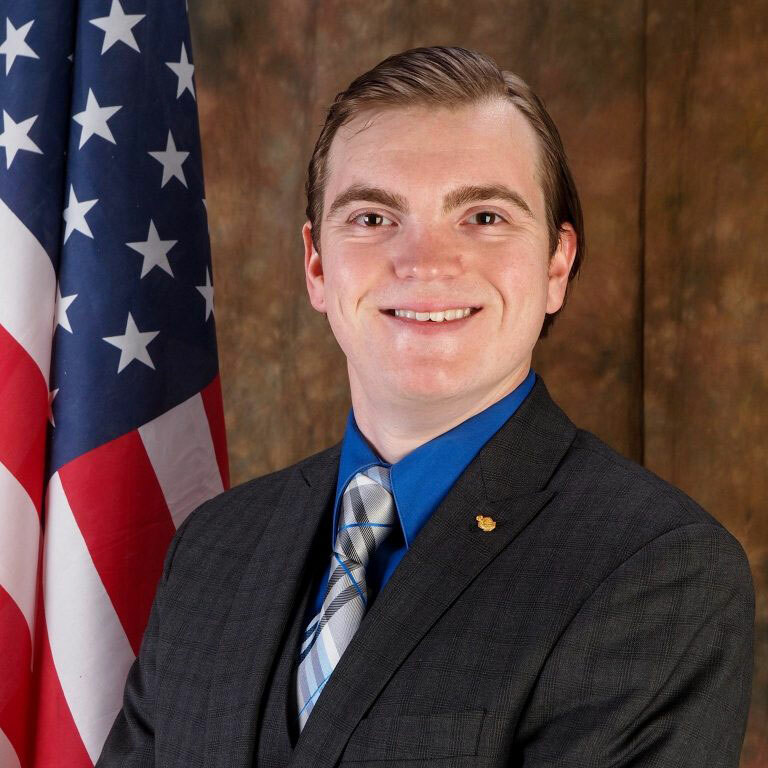 LANSING — Newly-elected State Representative Beau LaFave — among the youngest politicians in Lansing at age 24 — has drafted several bills and even introduced a few since his term began on Jan. 1. “I’ve really enjoyed it,” the Iron Mountain resident said about his experiences so far as a House Representative for Delta, Dickinson and Menominee counties in the Upper Peninsula. LaFave said he is looking forward to serving the citizens in the 108th District and wants to prove to them that he will work for them as hard as he can. Voters elected the young Republican candidate to the two-year seat this past November. He moved into his office in Lansing on Jan. 1 and has already drafted 15 bills he would like to see become law. Four bills were introduced to the House floor on Jan. 11, the same day LaFave was sworn into office. Among his concerns is an issue he campaigned on to offer juniors and seniors credits for high school for participating in internships at local businesses. The internships could be paid positions, depending on the businesses and each district’s choice, he said. LaFave said one of the main reasons he chose to work in the field of politics is because he saw so many graduates from his hometown being forced to move away to find jobs in skilled trades. He wants to encourage local businesses to partner with schools so students can learn skills for local jobs. Another concern of LaFave’s is the protection of the Second Amendment regarding the right to bear firearms. “I think that it’s important that we affirm that,” he commented, explaining his bill is about diminishing the “pistol-free zone” and expanding opportunities for carrying pistols. LaFave said he is also concerned about the dark store issue and will be working with state senators David Maturen (District 63) and Tom Casperson (38th District) who have been involved in previous legislation opposing property taxes for operating businesses being based on the value of an empty building. The first bill to be introduced on the House floor in 2017 was sponsored by Lee Chatfield (District 107) who wants to phase out the state income tax during the next 40 years, said LaFave who is supporting the legislation. “I’m in favor of it as long as it doesn’t decrease services or increase taxes in other areas,” he said, noting the bill will be sent to committee. In Michigan, a bill has to be read three times on the House floor before it can be voted on and forwarded to the Senate and the Governor, he explained. Committee appointments were announced in the House last week. LaFave will serve as vice chair of the Natural Resources Committee during the 2017-18 legislative session. He will also serve as a member of House committees for Energy Policy, Insurance, and the Judiciary. LaFave said he wanted to be appointed to the Insurance Committee because he is interested in working to reform Michigan’s no fault auto insurance by lowering the premium. He was also hoping to be on the Natural Resources Committee because of the importance of natural resources to the U.P. LaFave attended Gov. Rick Snyder’s 2017 State of the State Address earlier this month and invited as his guest David Brisson, CEO of Roadmaster and Great American Disposal in Dickinson County. Each state representative is allowed to invite one guest to the House floor for the Governor’s annual State of the State Address. “Small, local businesses provide the jobs and economic engine our communities and Michigan need, so it’s important to include our industry leaders’ perspective in the state government’s policy discussions,” LaFave said. In addition to being thankful to voters who elected him into office, LaFave said he is also appreciative of the help he has received from Ed McBroom, of Waucedah, who previously held the 108th House seat but was termed out after six years. LaFave said McBroom has been a great mentor for helping him transition into his new job representing the people of the 108th District in Lansing. LaFave, who lives in Iron Mountain and is a graduate of Kingsford High School, said he plans to get to know more about the district and will be hosting “meet and greets” and coffee hours in the three-county area. LaFave earned his bachelor’s degree in international relations and political economy in 2015 from Michigan State University’s James Madison College. He then completed one year at Wayne State University Law School in pursuit of his Juris Doctorate degree. LaFave said he decided to temporarily put his law degree on hold to run for election to serve the people of the U.P. LaFave can be contacted by calling 517-373-0156, emailing BeauLaFave@house.mi.gov or by mail at Anderson House Office Building, S-1487, P.O. Box 30014, Lansing, MI 48909.